Is Bone Marrow Stem Cell Therapy a Scam? There is a myth being propagated by quite a few stem cell clinics that the best way to perform regenerative procedures is by only using your bone marrow. Most of the time, it is NOT the best option by a long shot. In fact, I will lay out the reasons why bone marrow stem cell therapy is typically a terrible option for individuals looking to gain relief for orthopedic conditions. First of all, a bone marrow aspiration is not without risk. Studies show that up to half of individuals undergoing an aspiration from an area of the hip known as the iliac crest can end up with chronic pain for over six months. In addition, the peer reviewed literature shows a significant incidence of additional complications including pelvic fracture, vascular injury, bowel perforation and more. It’s not a risk free procedure. The nerve endings surrounding the pelvis are very sensitive, and they don’t like it when a big fat needle is placed through the area. 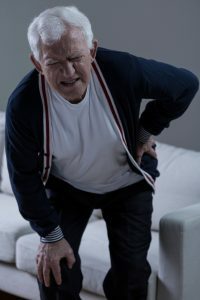 Usually, physicians will put the needle through multiple times in order to gain a higher cell count, so the incidence of chronic pain rises even higher! The biggest reason that bone marrow stem cell therapy is usually a terrible idea is what happens to our stem cell counts in our bone marrow with advancing age. The data is compelling, and the numbers are rarely if ever revealed to you by doctors wanting to perform a bone marrow procedure on you. Pain after bone marrow aspiration occurs in up to 50% of patients for over 6 months! Here is what the numbers show. In early life, one in 10,000 cells in your bone marrow is a stem cell. This is actually a lot. By the age of 50 this has decreased to one in 1 million cells in your bone marrow is a stem cell. This is a humongous drop of 90%! This means that your body is producing 90% less stem cells by the age of 50 then it did during early life. By the age of 70, the numbers even get dramatically worse. By the age of 70, only one in 2 million cells in your bone marrow is a stem cell. This means there is a 98% drop in the amount of stem cells that we make at the age of 70 compared to when we were infants. What this means is that even under the best of circumstances after the age of 50, doctors can only achieve a few hundred thousand stem cells to use with a regenerative procedure. Compare this to umbilical cord tissue that has not undergone radiation and may contain over 11 million live stem cells per milliliter. All of these numbers are verified by unbiased third-parties. 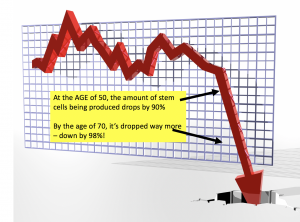 In actuality, what this shows is that bone marrow stem cell therapy after the age of 50 is usually a terrible idea, with people fool ing themselves if they think the numbers can actually produce a significant clinical result. Does this mean all bone marrow stem cell therapy should be considered a scam? I actually don’t like that word, but I do think there are plenty of physicians and companies who perpetuate a myth that it is ALWAYS the best option. Years ago, in order to increase the stem cell counts from Bone Marrow, companies would culture your tissue. This means you would have the aspiration done and then go home. They would then bring you back in a month to have your bone marrow procedure done. The FDA no longer allows this. So if you want a cultured procedure, you will need to go internationally. But don’t bother, it makes NO SENSE to do that. Over the past six years, R3 Stem Cell’s Centers of Excellence have successfully performed over 10,000 regenerative procedures. These have mostly been performed with amniotic and umbilical cord tissue. What’s interesting is that while the “bone marrow competition” says that amniotic and umbilical products have no live cells, the products we use in fact have millions of live cells. The products used at R3 Stem Cell’s Centers have been tested by an unbiased third party after processing, in a situation just like where it would be used in a procedure. 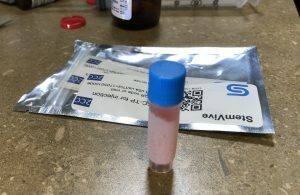 What these tests have shown is that there are over 10 million live stem cells and many millions more when it comes to exosomes, secretomes, cytokines and growth factors. Only radiated products have no live cells, and that is not mandated by the FDA. Currently, R3 Stem Cell offers free consultations nationwide at over 35 Centers of Excellence. Call us at (844) GET-STEM to find one closest to you!